What a great chart and what a great touchstone to have students write essays on supply, demand, prices, capital investment, risk, technology, politics, and more! Tide for 19.20 a gallon? Yeah, and the price of gas includes a big chunk of taxes, and the ethanol will attract water in the carburetor of your rototiller. I’m convinced that most people think everything should be free. 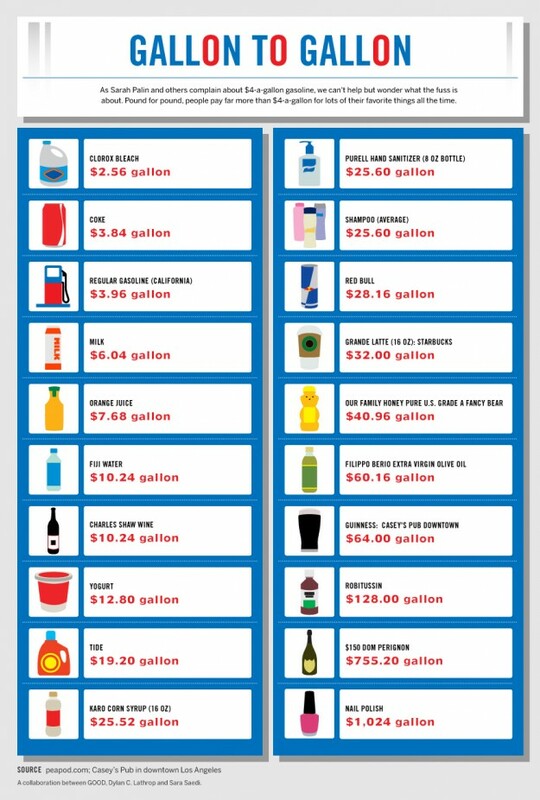 People don’t seem to be very concerned when I point out to them that the government makes more money than the oil companies do on the sale of a gallon of gas. I shop carefully for olive oil. Of course, the political economy is different. I do not care if it comes from Spain or Cypress. I do care how it looks. (Can’t taste it first.) With gasoline, we have a forced domestic market and competition is minimal: a cent or two per gallon per city block, perhaps. Michael: Were you kidding about gasoline and competition? Competition for retail gasoline is vicious. In what other industry do you see firms competing by hanging out a giant sign with the price on it? A cent or two difference in prices is evidence of EXTREME competition — gasoline is a commodity, the ONLY way gas stations can compete is on price. If one station was charging $2.50 and the other across the street was charging $4.99 would this satisfy you as evidence of competition? I worked in a convenience store / gas station in my youth, let me fill you in: the (accounting) profit margin on a cup of coffee is much, much higher than it is on a gallon of gas. It is essentially a loss leader.